Half diamond eternity ring, 0.50cts of princess cut diamonds held within an offset channel across a 4.25mm wide band. Our delightful off-set channel setting is a delight on the finger. 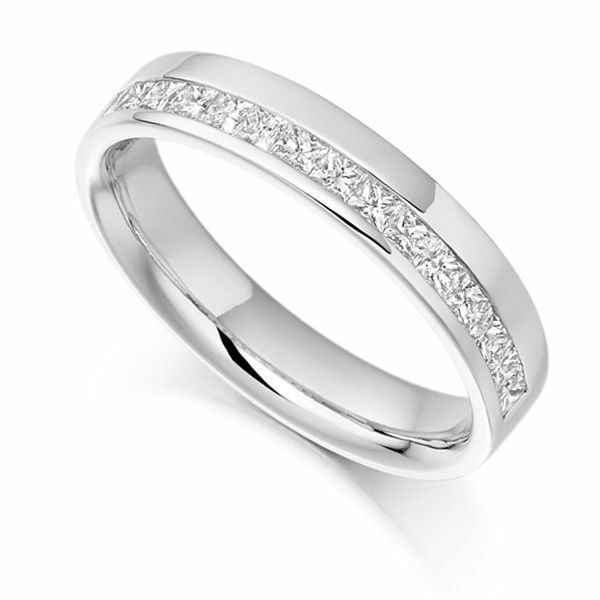 Precision set with Princess cut Diamonds in a 4.2mm ring width. With a total Diamond weight of 0.50cts, each Diamond has been graded F Colour VS1 Clarity, making this ring a beautiful addition to your ring collection. designed to be comfortable to wear and secure, this Eternity Ring from Serendipity Diamonds offers a unique and different style with the symbolic feel of a traditional Wedding Ring. We can create your ring for you within 3-4 weeks and have it delivered to your door in our bespoke packaging, fully insured in a discreet outer wrap. With the piece of mind of a 60 day returns policy and a detailed valuation you can rest assured that you have a unique and desirable ring. We can create this Eternity Ring in 18ct Yellow Gold, 18ct White Gold, 18 ct Rose Gold, 950 Platinum or 950 Palladium.